Argentina won their first Davis Cup ever after defeating Croatia 3-2 and coming back from a 2-1 deficit on Saturday in Zagreb. Juan Martin Del Potro battled back from two sets down against Marin Cilic and Federico Delbonis defeated Ivo Karlovic in the fifth game of the series to become the heroes of an Argentinian team that had failed to win the Davis Cup in four previous tries. Cilic won the first game of the series against Delbonis in five sets, then Juan Martin Del Potro won his game against Ivo Karlovic in four sets to give Argentina a 1-1 tie the first round of individual matchus. In the doubles match Croatia won in straight sets (7-6, 7-6, 6-3) to take a 2-1 lead. That left Argentina with a glum outlook and a huge challenge in the second round of individual matchups: They had to beat the Croatian team in front of their raucous home crowd to avoid re-living the ghosts of past finals, which they failed to win in 1981, 2006, 2008 and 2011. Del Potro, ranked 38th in the world, played the last set of his second individual match with a pinky-finger injury in his left hand as he carried out his amazing comeback against Cilic, who is currently ranked sixth in the world. After that, and with the scored all tied at two, Delbonis sealed the deal with a victory in straight sets (6-3, 6-4 and 6-2) and put an end to their own curse that saw players such as Guillermo Vilas, Jose Luis Clerc and David Nalbandian fail in their attempts to win the most coveted trophy in international team tennis. The victory was a especially sweet one for Del Potro, who was part of the teams that lost the final in 2008 and 2011 and had never won an individual match in his previous two participations. Including this encounter Del Potro and Cilic, both 28-years-old, have met 11 times in head-to-head competition during their careers. So far the supremacy of the South American is indubitable as he holds a 9-2 advantage. 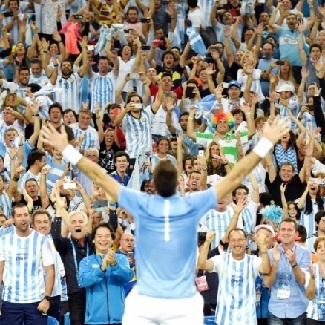 Karlovic had won in three of the four previous times he had faced Delbonis, but this time he could not beat the Argentine even with the support of the fans behind him. Around 4,000 fans travelled from Argentina to Croatia to see this Davis Cup final, including soccer legend Diego Armando Maradona among them.